The heavyweight division is currently in a good place excitement-wise. There have recently been two big world fights that, although not absolute classics, sure came close – Anthony Joshua-Wladimir Klitschko last year and Deontay Wilder-Luis Ortiz this year – and the good times seem to set to keep rolling. We await the intriguing Joshua-Joseph Parker unification clash of March 31, as we also await former world champ Tyson Fury’s return (Fury by the way, today put out a message on social media, saying he is close to announcing “a massive, massive deal”). But the big one we all want to see, need to see – is of course Wilder Vs. Joshua, a fight that would, as the saying goes, contest all the marbles. Who is the top dog of the sport’s premiere division right now? Who will emerge as the king of kings when all the smoke has cleared? Again, exciting times are very much upon us. 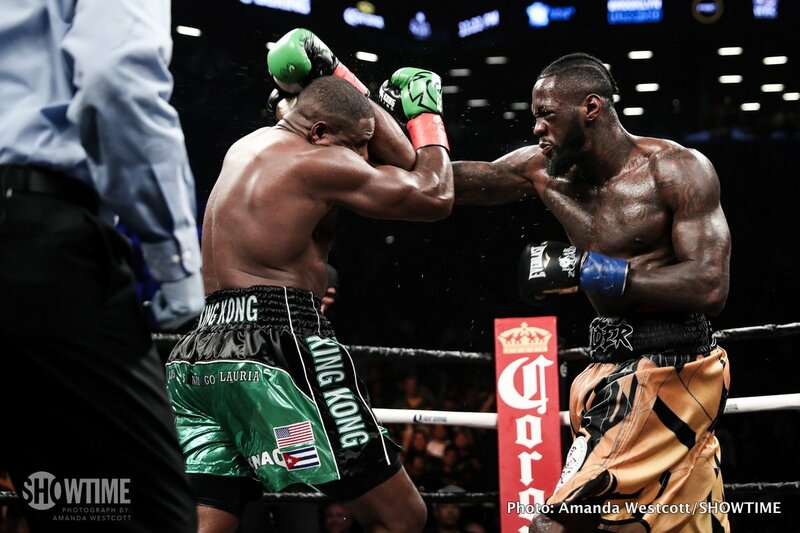 1: Deontay Wilder, WBC champ – 40-0(39). Last fight: KO10 Luis Ortiz. Next fight: TBA, but Joshua is very much the target. 2: Anthony Joshua, WBA/IBF champ – 20-0(20). Last fight: TKO10 Carlos Takam. Next fight: Joseph Parker, March 31. 3: Alexander Povetkin – 33-1(23). Last fight: WU12 Christian Hammer. Next fight: David Price, March 31. 4: Joseph Parker, WBO champ – 24-0(18). Last fight: WMD12 Hughie Fury. Next fight: Anthony Joshua, March 31. 5: Luis Ortiz – 28-1(24). Last fight: TKOby10 Deontay Wilder. Next fight: TBA. 6: Kubrat Pulev – 25-1(13). Last fight: WU12 Kevin Johnson. Next fight: TBA. 7: Dillian Whyte – 22-1(16). Last fight:WU12 Robert Helenius. Next fight: Lucas Browne, March 24. 8: Jarrell Miller – 20-0-1(18). Last fight:TKO9 Mariusz Wach. Next fight: Johann Duhaupas, April 28. 9: Dominic Breazeale – 19-1(17). Last fight:WRTD8 Eric Molina. Next fight: TBA. 10: Hughie Fury – 20-1(10). Last fight: LMD12 Joseph Parker. Next fight: Sam Sexton, for the British heavyweight title, May 12. In all fairness, it’s really a toss-up who is deserving of the top-spot; Wilder or Joshua, but this is simply a reflection on how badly we need to see these two young, unbeaten and terribly exciting rival heavyweight champions get it on. And soon.